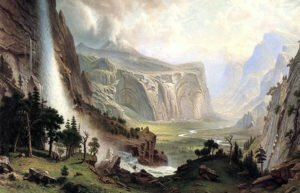 St. Johnsbury ~ Eleanor Jones Harvey, senior curator at the Smithsonian American Art Museum, will share the story behind Albert Bierstadt’s massive painting of Yosemite on May 2 at 7:00 pm at St. Johnsbury Athenaeum—where the painting has hung for more than a century. Her talk, “Bierstadt’s ‘Domes of Yosemite’: The Creation of an Icon,” is part of the Vermont Humanities Council’s First Wednesdays lecture series and is free and open to the public. Please note: This First Wednesdays talk takes place on a special date on a Thursday. Yosemite was more than the first federally protected American landscape; it was an emblem of freedom in the years surrounding the Civil War. Harvey will discuss the story behind Bierstadt’s monumental painting, weaving together several historical threads to deepen our appreciation of Yosemite as part of our national identity. Eleanor Jones Harvey is senior curator at the Smithsonian American Art Museum. She earned a BA with distinction in art history from the University of Virginia (1983), and an MA (1985) and PhD (1998) in the history of art from Yale University. She served as the Museum’s Chief Curator from 2003-2012, overseeing the museum’s curatorial and conservation staffs and its acquisitions and collections programs. Prior to coming to the Smithsonian, she served as the curator of American art at the Dallas Museum of Art, where she organized several exhibitions. She has contributed essays to numerous books. Her current project, American Cosmos, focuses on the impact the German naturalist Alexander von Humboldt had on American art, literature, science, politics, and exploration. The Vermont Humanities Council’s First Wednesdays series is held on the first Wednesday of every month from October through May in nine communities statewide, featuring speakers of national and regional renown. Talks in St. Johnsbury are held at St. Johnsbury Athenaeum unless otherwise noted. All First Wednesdays talks are free and open to the public. See the full schedule of St. Johnsbury First Wednesdays talks. The First Wednesdays 2018-2019 series in St. Johnsbury is underwritten by St. Johnsbury Academy. “Bierstadt’s ‘Domes of Yosemite'” is underwritten by Passumpsic Savings Bank-Member FDIC. St. Johnsbury Athenaeum is sponsored by Adler and McCabe, PLC and Friends of the Athenaeum.